Beautiful shoes and such a fantastic service. Fast delivery too. Thank you Little Wanderers. Extremely quick delivery, well packaged and excellent product. Highly recommended. Children's pumps ideal for P.E at school. Our kid's plimsolls come in three differing styles. We have Velcro fastening pumps in half sizes, or plimsolls that are elasticated at the front and are easy for young children to put on themselves. For older children there is also the choice of lace fastening plimsolls. 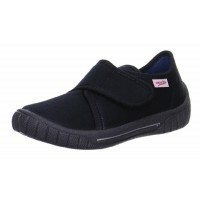 These black plimsolls are also an ideal footwear option for dance schools and theatre groups. If you are looking at bulk purchasing black pumps from us then please contact us in advance for details of how we can help you further.